The paid circulation of African American newspapers has since 1993 declined, and they are instead circulated increasingly as freesheets, write Stephen Lacy and Daniel Krier, both of Michigan State University, with Sandra L. Combs, of Arkansas State University (names not in original order). The authors gleaned data regarding African American papers from the Editor & Publisher International Year Books and compared numbers from 1993, 2003 and 2013. First, the authors noticed that the African American press, too, was hit by the “Great Recession” of 2007-2009. The number of titles had already decreased slightly between 1993 and 2003, but the following decade saw 40 papers disappear from the data, to be replaced only by 15 newcomers. This also caused another ten US cities to become void of newspapers dedicated to serving the African American community. The mean paid circulation of the papers declined from over 20 000 issues to less than 15 000 between 1993 and 2013. Instead, free distribution expanded from a mean of just under 3 500 to nearly 14 000. The increase of freesheet circulation, however, was not enough to offset the decline in paid subscriptions: the penetration rate of the papers still decreased slightly. In 1993 there were, on average, 17.5 issues of African American newspapers circulated for every 100 African American residents. In 2013 that number had gone down to 16.2. In terms of online adoption, African American papers were ahead of the curve compared to general circulation papers, the authors note. In 2013, “almost 83 percent” of the papers had an online presence, compared to only 63 per cent of general circulation papers. The article “African American weeklies see paid circulation decline” was published by the Newspaper Research Journal. It is available online on the publisher’s website (free abstract). 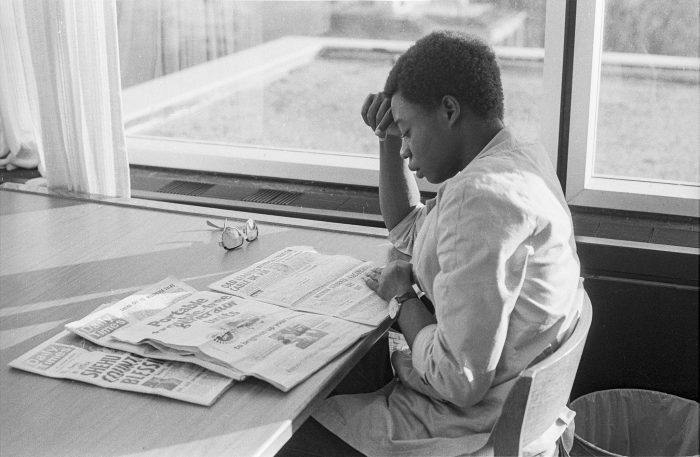 Picture: Young woman reading newspaper at Ohio Univeristy, 1980, photo courtesy of Ohio University Libraries, licence CC BY-NC-ND 2.0.